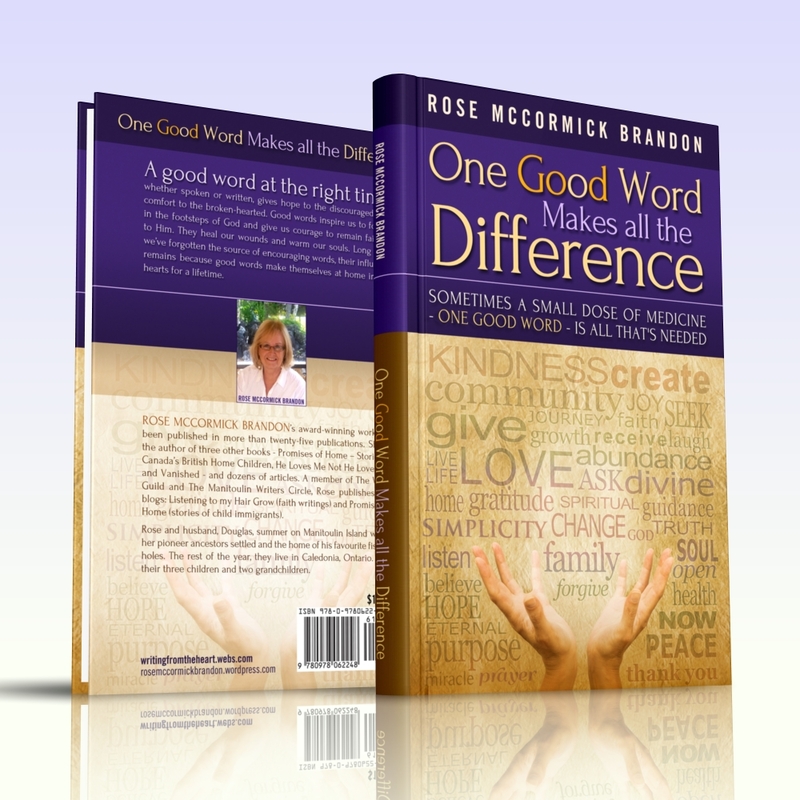 Rose McCormick Brandon is the author of many articles, stories and devotionals, as well as four books – Promises of Home – Stories of Canada’s British Home Children, One Good Word Makes all the Difference, He Loves Me Not He Loves Me and Vanished. She publishes two blogs – Listening to my Hair Grow, an encouraging place for Christ-followers and Promises of Home, an on-line magazine dedicated to telling the stories of British Home Children. The era of child immigration, 1869-1939, is an important part of Canadian history. More than 10% of Canadians are descendants of a British Home Child. Rose’s work has been published in many magazines, newspapers and compilations in Canada, the U.S. and Australia. Purchase Rose McCormick Brandon’s books here. Thanks!! I’ve done step one and am off to do step two. Have a great day! Mary, very interesting that you were raised in a children’s home. I’m so happy to connect with you. I just wanted you to know that I appreciate your devotions in the Daily Boost. Everytime I see that you wrote it I get excited, your devotions always hits home. Thanks again for what you do, and may God’s blessing and favor fill your life. Sounds intriguing – will definitely check it out. Hello Rose, It’s so nice to meet you here. I love your story. It resonates with my writer’s heart, and you are a sister in the Lord. Besides that, we both have the same lovely name. You have a beautiful blog and I’m really enjoying persuing it. May God bless you and every word you write for His glory. I am not sure whether or not you are the one who wrote the wodnerful story “Manitoulin Connections,” from ‘O Canada’ book of the Chicken Soup for the Soul series. The story, however, touched my heart and soothed my soul in a very positive way. Thanks for the invitation. Sounds like a worthy project . . . I’ll send something to you. Debbie – Thanks for pointing out that my bio has disappeared. It used to show up at the end of each post. WordPress loses it settings once in a while. I’ll correct that. Also, thank you for your kind comments about my writing. Encouraging words like yours keep writer like me clicking away on our laptops. Hi there 🙂 I have been reading your blogs for over 2 hours now and I cannot find your name anywhere. I think I started from emails from the Word Guild, but I can’t even trace you back to them. I’m surprised to see page after page of your stories and nowhere can I see your name. By the way, your stories are wonderful, and I found myself wanting to keep reading the next one as the titles all seemed to say they had answers to my questions or needs. Bless you for writing and I really enjoyed your voice. Every sentence smooth, inviting, understandable, not once did I have to get out the dictionary, and I felt uplifted, peaceful, and like I knew a little bit more about God with every story. I also sensed your true love for Him and your passion to write for others benefit not your own. You truly are a blessing and an ambassador of our Lord Jesus Christ.